Approach Direction: From the West. Departure Direction: To the East. Brian Vike's, The Vike Factor Update: I have been speaking to a wonderful man by the name of Carl Wilson. 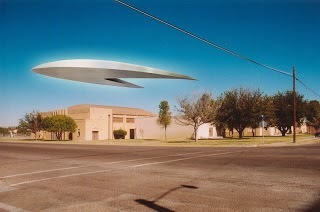 His major UFO sighting took place as you will read back in 1972 in Fort Stockton, Texas. A while back Carl sent the report in, I then called Carl up and did an interview with him for my radio show I host called the "Vike Report". Also to gather more information about the event. Carl told me a lot more about what he has been going through besides what had been reported. Tonight I received an email from Carl, I then picked up the telephone and called his home and we spoke for some time. It appears Carl has been going through abduction experiences, or something that I would class as extremely unusual, but related to his massive sighting in Fort Stockton, Texas. Carl also sent along a number of photos he had taken, or I should say his wife had taken the photos of what appears to be scoop marks and a possible laser cut. In the photos these marks and cut can be clearly seen, this tells me something has been happening to him over the great number of years. Still to this day, unusual things are happening in this couples home. I found Carl to be a wonderful man to talk with, he is a level headed man and not someone to take things to the extreme at all. He tries to rationally figure out what is happening, looking for a normal answer, but as of yet there appears not to be a rational answer for what is happening to him. I would also like to add, due to the number of emails I and others received saying the pictures were fake over the craft itself. The photos were not taken in 1972. The photos were taken a few months ago when Carl and his wife went to visit his mother. 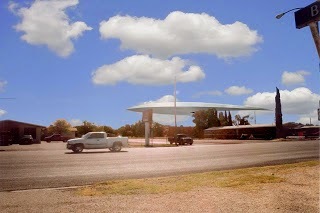 The couple went through Fort Stockton, Texas so Carl could take pictures of the area where he was able to observe the craft. He later at home uploaded the photos to his computer and using Photo Shop he tried his best to re-create the craft he witnessed, which there were more than one of the same. So the pictures are real, but the craft in the photos were made with Photo Shop and then embedded onto the real pictures ! Description: Although this sighting happened in 1972, I was afraid to go public with it because of my paranoia of the Government and the ridicule of my friends or family. What I am about to tell you needs further investigation because there were numerous witnesses at the time. Yet, it never was mentioned by the media. This sighting happened when I was a Sophmore in High School at Ft. Stockton, Texas. Ft Stockton is a small town of 10,000 in far west Texas on the way to El Paso. Above Picture: Welcome Sign To Fort Stockton. At that time, my dad was a Route Delivery Driver for the Dr. Pepper Company, out of Pecos Texas. I remember that it was a Saturday because Ft. Stockton was his main route on Saturdays. We were on Main street and we were making a delivery to a small Convenience store called "Pick Pack Groceries"
Just as my dad parked the truck in front of the store, he reached across my brother, and slapped me on the chest. Then he said, "You boys ever see a UFO?" I replied, "No, Sir." Then he said, "Well, there's ya one right over there." Then he pointed out his driver side window toward a street called "Colpits Street." There was an Elementary School just a few yards from the corner of Main and Colpits and right up above the school was a Silver object about the size of a Football Field. It hovered about 50 feet above the school and it was shaped like a boomerang. From my position I figured that it was about 10 to 15 feet thick. Below Image: Computer graphic showing the UFO over top the Elementary School. But the strangest thing about the incident was, how the people in Ft. Stockton reacted to it. As my dad got out of the truck, he said in a rough voice, "I don't want you boys watching that damn UFO. We got work to do." So my brother and I unloaded the cases that he needed, but every once and awhile I would glance over to the School to make sure that the silver boomerang was still there. I even noticed a couple of cars that pulled over to the side of the road and people getting out and pointing to it. After we unloaded the truck, I had to go inside of the store to help my dad stock the shelves. But the first thing that I noticed was how weird every one was acting. There were at least 15 or 20 people in the store and not one person was reacting to the boomerang across the street. And it could clearly be seen outside of the store windows. So I asked the man behind the Cash Register if he could see that shiny thing above the Elementary School across the street. Then he replied, "Yeh! What is that thing." And I replied, "My dad says that it's a UFO." "That Right?," he replied. "Strangest thing I ever saw," he said as he continued to ring up a customer. "So, you can see it?" I asked. Because I was confused as why no one was reacting to it. I thought that every one would drop what they were doing and rush outside to gawk at it. But the Cashier just rang people up like it was an every day event. And everyone else was acting the same way. They were milling around the store gathering up chips and dips and checking out at the register like nothing was going on. So I had to get confirmation that I wasn't the only one seeing things. "So you can see that?" I asked one more time as I pointed out the store window. "Yep!" he replied. But it didn't end there. I knew that we would be making deliveries for the rest of the day and I was disappointed because our route would carry us away from the silver thing. Above Image: A sketch Carl did of the UFO he witnessed. But my disappointment didn't last very long. I was sitting near the door on the passenger side of the truck as we drove down Main street. My door faced toward the south side of town and Ft Stockton is as flat as a pancake. The Tallest buildings were downtown and they weren't any taller than two stories. But the junior High School was at least three stories high. And there it was. Another one, was hovering over the Junior High. And I saw one more, or it could have been the same one hovering over the far edge of town near the south. The only thing on that side of town was the main Hospital and a Trailer Park. I got the impression that it was over the trailer park. The whole incident lasted more than three hours, because that is the time that it took us to make our deliveries as we traveled east down Main street. Every time we took off to the next stop I would look out of the passenger side window for the silver boomerangs and I saw them throughout the rest of the day. But it was how the people reacted that blew me away. People were going about their business like nothing was going on, even though occasionally a car would pull over and people would get out to point in the same direction that I was looking. But it still didn't end there. Our last delivery was to a Gas plant about 40 miles east of Ft. Stockton. Once again I was disappointed because we were leaving something that was utterly phenomenal. But believe it or not, I could see it far to south as it passed us, as we traveled east. I even got the impression that it was following us. Then, there it was again. Another one was hanging over the community of the Gas Plant. My dad looked terrified and he warned us once more to pay attention to our work and not be staring at the UFO. So he parked the truck facing away from the boomerang. Then we unloaded the drinks and my dad went back inside the office to settle up. While he was gone my brother and I waited in the truck. Then my brother grabbed a magazine from underneath the seat and started to read it. I was astonished at the way he was reacting to everything thing, because I felt like a kid in a candy store. All I wanted to do was get out of the truck and stare at the big silvery thing, but I feared my dad more. So I asked my brother if he could see it. He replied "Yeh! Why?" "Well, don't you even care?" I asked him. "Daddy says that it's a UFO. But every body's acting like it isn't even there." then he replied, "Yeh, and Daddy told us not to be watching it. So I isn't watching it. If you want to watch it that's your problem. But I am not getting into trouble. 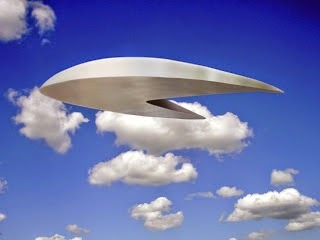 Above Image: Another graphic showing the shape of the UFO, which was a boomerang. I'm going to read this magazine." Then I looked out of the rear view mirror and watched it as I thought about it. I wondered why my dad was so terrified and remembered thinking that they were taking everyone. Including my dad. He was gone for two solid hours. When he came out of the office, he still looked terrified and he never said a word. As we drove off I noticed that the boomerang was gone. On the way back to town I kept looking for it, but I never saw it. So, I decided to ask my friends about it the following Monday after I went back to school. But I never did. I completely forgot, even though I searched the News Papers for weeks for any kind of story. There were even rumors of a rash of sightings and cattle mutilations. But that particular sighting was never even mentioned. It wasn't a blimp and I knew that our government didn't have that kind of technology back then. I know that there were numerous witnesses and my brother is still alive today. So he can confirm everything that I have written. If there is anyone from Ft. Stockton that remembers anything remotely similar I sure would like to hear from them. Color/Shape: Silver like Foil - Shape of a boomerang and the size of a football field. Thank you to UFOINFO for this report. Below Information: Reply to UFO Investigator Brian Vike of The Vike Factor. Mr. Vike, Thank you for taking an interest in my story. You are only one of a hand full of people that I have ever shared this with, but my wife encouraged me to get the story out. I would like to find more witnesses from Ft. Stockton though. Last year I sent an inquiry to the Ft. Stockton News Paper "The Pioneer" and I got one response. Someone sent me an E-mail and they told me that they remembered the rash of sightings in the 70's and then they told me about one of their own experiences. He said that he was afraid of going public with his story, but he told me about a cattle mutilation that occurred on his fathers' ranch. Then he told me of other sightings he and his family had witnessed. But he begged me not to tell anyone. Now I would like to explain a little bit about my own story. I worked on a sketch like you asked me to but I went a little further. I have been a photographer and an artist for most of my life so you should really enjoy the photos I am sending you. I enhanced them in a software program called Photoshop. So the attachments I am sending you are huge. Just in case you want to make yourself an enlargement or two. My wife and I live in San Angelo Texas, about 200 miles east of Ft. Stockton. 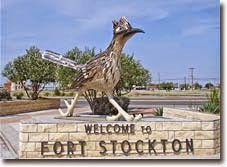 So, to make a long story short, my wife and I drove through Ft. Stockton to see my mother 60 miles west in Ft. Davis. On the way back I took photos from the actual spot that I saw the silver craft. There are two pickups in the photo, one stopped at the intersection on Colpits Street and the other traveling east on Main Street. The scene is almost identical to what I saw, except for a couple of things. I noticed that I was standing too close to Main Street when I took the photo. My dads' truck was parked closer to the store. So it would have been 30 feet back. Another thing that I noticed were the trees. I don't think the trees were that tall at that time. Then there is the boomerang itself. What I saw, always reminded me of a giant silver wing. It was thick at the front and then it tapered toward the back, and it was more rounded. The picture I sent you makes the bottom look flat, but I think it was more rounded. Above Image: Another graphic showing the shape of the UFO. The other photo I sent shows the same object as it "would have" appeared if I were standing in front of the Ft. Stockton Junior High. The Junior High School was less than half a mile from Main Street. So I could clearly see it because it was so big. The objects I saw were hovering over all of the Schools in town. Which brings up another question. My dad was known for making me and my older brothers skip school on some occasions to help him with his route. He usually made his Dr. Pepper Deliveries in Ft. Stockton on Saturdays, but it could have been a Friday, because I can't understand why a craft would be hovering over school if no one was in them. So, it is really hard for me to pinpoint the exact day and year. My dad owned a gas station for two years before I left home. I graduated in 1974, which meant the incident must have occurred in 1972. But for the life of me, I cannot remember the exact month. It was a bright sunny day and I do remember that school was almost over for the year, which means that it was sometime between March and May of 1972. Mr. Vike, I am sending you some attachments of scoop marks, laser cuts, and skin grafts that my wife and I have found on ourselves over the last couple of years. I think that you will find these very intriguing. I have more photos but I am having a hard time finding them all. I can't find the ones of the finger prints that looked like burn marks on my left forearm. But I will tell you an interesting story relating to some of the photo's I am sending you. 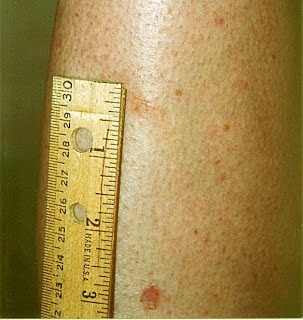 Above Photo: Marks on Carl's wife's leg. This story has to do with another dream that I think is more reality than a dream. I dreamed that I woke up in a hospital room while I was laying on my back. I had an I.V. in my arm and one in my neck. I looked around the room and to my right, there was a beautiful blonde, female nurse standing on a ladder adjusting the curtains that covered the hospital room window. Once I noticed the I.V. in my arm, I got angry and I jerked it out, then I jerked the other one out of my neck. The nurse heard me stirring in bed, then she looked down from the ladder and saw me pulling the I.V. 's out. Then she said "OH! Hell!" and started climbing down the ladder to stop me. I looked over to my left side and my wife was in another bed beside mine. She too had I.V. 's in her arm and the side of her neck. So I jumped out of bed started jerking the I.V. 's out of her arm and tried to wake her up. She had this long skinny needle sticking out of her neck, so I jerked it out too. Then the nurse pressed a button on the intercom in the room and she said, "We have a code Red (not exact code), I repeat, we have a code Red." Then I tried to wake my wife up, but she was completely out of it. Then the nurse said, "Come on Mr. Wilson, every things going to be OK. You need to go back to bed now." But I panicked and I tried to run out of the room. The room was huge. I would say that it was at least 20 x 30 feet. I say that because just as I got to the door when a man stepped into the room through the doorway. He was dressed in a leather suit that resembled the armor that knights wore. He had thick pieces of leather that covered every part of his body, including his crotch. I told you before that I have a couple of degrees in different forms of Karate. So, I thought that it was kind of humorous when he said, "Come on Mr. Wilson, you don't want to do this." Even as he said that, I got the impression that he had dealt with me before and the suit was made to protect him. Then the scene changed and I was sitting on a box covered in carpet in a different room. The nurse was on the left side of me and the man in the suit was restraining me from behind. Then a military officer dressed in a blue uniform, complete with bars and medals approached me. He had a jar of peanut butter in his hand and he dipped a spoon in it. Then he walked right up in front of me with a big old grin on his face and said, "OK. Mr. Wilson, it's time to forget." Then I woke up from the dream. After I awoke, the dream was so vivid that I woke up my wife to find out if she could remember anything, then I asked her if I could look at her neck. Immediately I noticed the scratch marks on her neck and a raised indention that was in the same spot that I jerked the needle out of. I said, "Don't move." Then I jumped out of bed and grabbed my camera and started taking pictures. The whole time I was taking pictures, she was saying, "What? What is it?" So, I told her about my weird dream, then I asked her if she remembered anything. She told me that she didn't remember anything about a hospital room, but she told me about a weird dream that she had too. She said that some short beings had taken her to a futuristic city and she was on a moving sidewalk like a conveyor belt, looking down on the city. She said that there were moving sidewalks that went from one building to the next. She said that it was too hard to describe, but the buildings looked like transparent glass of all different shapes and sizes and colors. Now this is important, because my wife very seldom remembers her dreams and she swears to this day, that she has never had an experience with abductions or even seen a UFO. After my wife got up, she took a shower. Then she called me into the bathroom to show me a strange mark on her right shin. She noticed it when she was shaving her legs. The mark looked like two flags crossing each other and it looked like it had been grafted out of her skin. She also had a strange mark the size of dime up above it. You can see them in the photos provided. If you look closely you can even see the bruising that surrounds the mark. So, once again, I grabbed the camera and started snapping away. Then I took a shower and got dressed. After I put on my socks I could feel a stinging sensation on my shin so I started to scratch it. I noticed the mark on my shin. Mine looked like a thin laser cut about one half inch long. After I got the pictures back and scanned them into my computer I noticed the bare spot above the laser cut. If you look closely, the scar almost looks like a perfect circle that has been burned into my shin or skin that has been grafted out. I also noticed that no hair is growing in the scar. This is the same shin that used to have a BB like object under the skin until it disappeared on day. I also had a another dream that involved a military officer and aliens a few months before. But I will tell you that story later if you are still interested. I am also sending you a copy of my Taxi Permit and my temporary pass to the Good Fellow Air force Base in San Angelo. There is so much more to tell you, that I have to do it in bits and pieces, because I don't want to overwhelm you with too much to read. I wouldn't mind doing another interview with you, but so much has happened to me over the last few years that this only scratches the surface. Thank you to the witness for the wonderful and very interesting sighting report. Also I would like to thank the gentleman for the wonderful diagram and graphic work to show what this object looked like. Brian Vike has done a couple of telephone interviews with Carl for what he saw. The size of the file is 32.3 mbs and it is 34 minutes in length. I saw it, too. I think the adults didn't react to it because it wasn't a threat and small town folks don't like any controversy. There would have been no profit in talking to the press about it and it would have attracted a bunch of unwelcome gawkers.